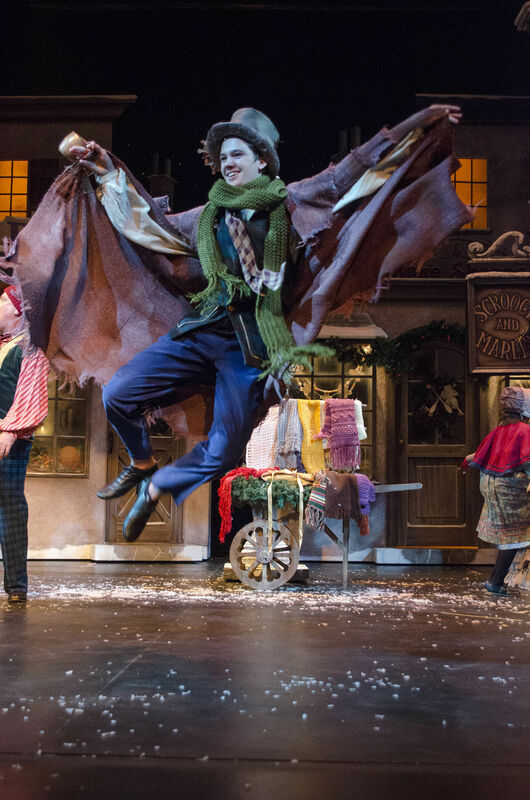 –All photos courtesy of A Christmas Carol musical production. The Christmas classic A Christmas Carol graced the Fox Theater with a magical Victorian presence. 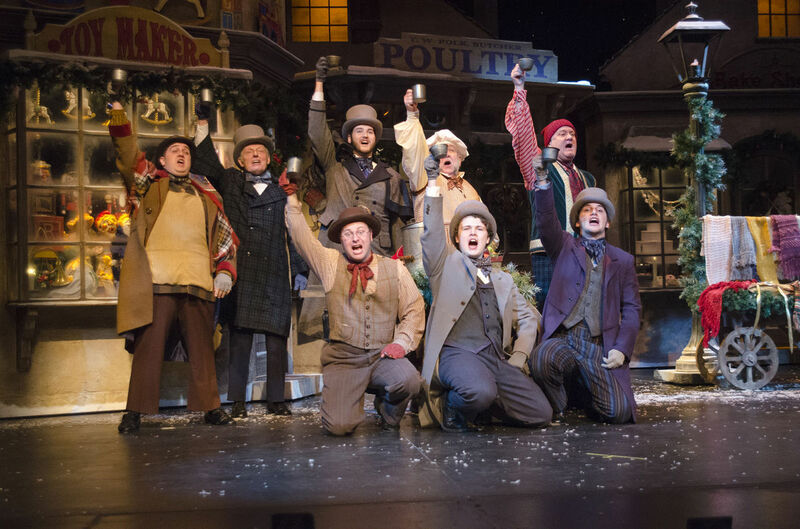 Beginning as the curtain opens to a beautiful and very detailed set of old town London, wedged between the toymaker and Scrooge and Marley, the scene comes to life with the town’s people happy to see one another and excited about the Christmas holiday. Scrooge’s nephew has come to town to wish the old man a happy Christmas, with the town’s people shaking their head, because he throws him out every year. The cast does a wonderful job of preparing the crowd for the coming scenes. The musical classics “God Rest Ye Merry Gentlemen”, “Good King Wenceslaus”, and “Away in a Manger” prepare you to delve into the psyche of Ebenezer Scrooge. The ghost of Christmas past takes you on a ride into Ebenezer’s past that begin to paint a picture of where it all when wrong for Mr. Scrooge. It opens with a scene of young Ebby(played by Alex Baylard) embracing his little sister Fan (played by Emma Johnson). She obviously adores him and is so grateful that he has returned to the family home for the Christmas feast. You later realize that is one of the last times Ebby will see his sister before she dies. In the next vision, it flashes forward to Ebby as a young adult apprentice for Fezziwig. The entire company has gathered in the warehouse for a big Christmas party. Everyone is dancing to “Susanni” and at the end you see young Ebby propose to his sweetheart Belle Fezziwig. 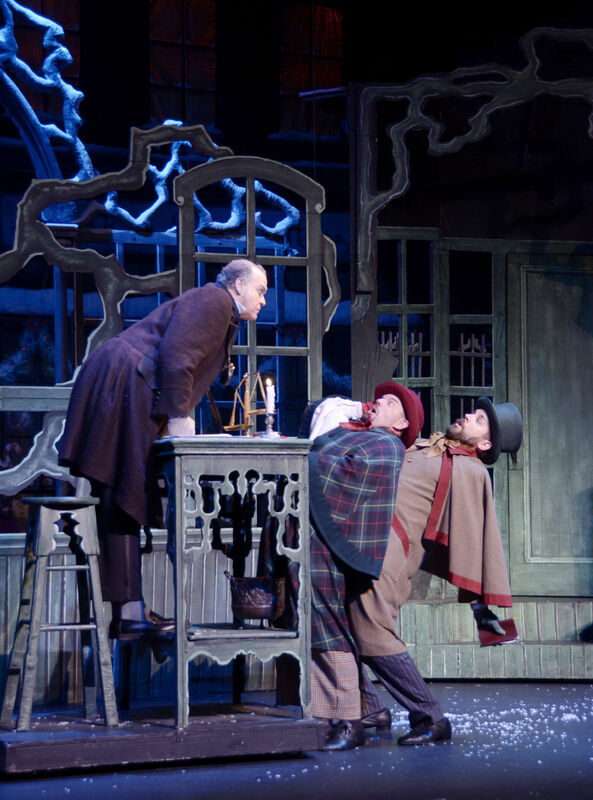 It is wrenching to watch Scrooge (played by Andy Harvey) begin to fall apart, as the scenes from his once happy life play before him. In all the classics I have seen in my life nothing really prepared me for this adaptation. Charles Jones does a wonderful job developing the Scrooge character. 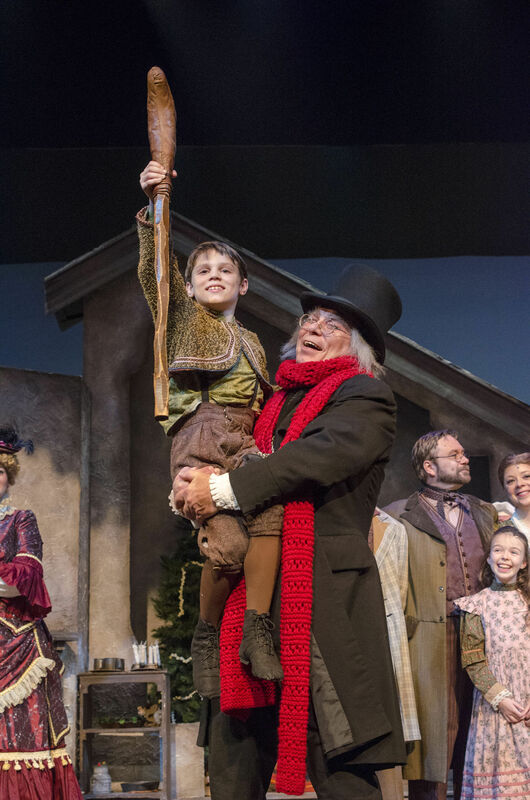 The story brought to life by directors Kimberly Faith Hickman and Jeff Horger really pulls you into the story of how Ebby, the adored young professional, evolves into Ebenezer Scrooge. 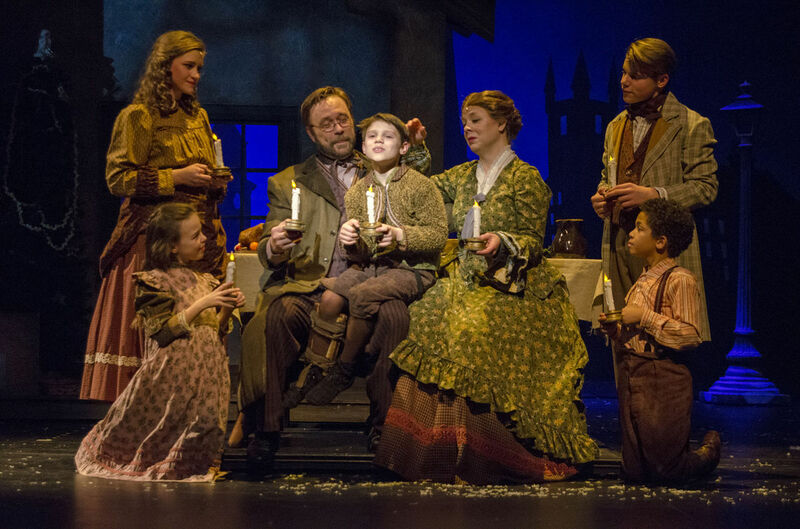 In a “Christmas Yet to Come”, you can see Cratchit(played by Andy Brown) arrive late to the family home. Ebenezer had a way of making that happen. You can see by the grief that seems to cloak that room, that he didn’t make it home before his son (who we all know as tiny Tim) Tim (played by Sasha Denenberg), had finally been taken by his illness. Scrooge finally began to put the puzzle pieces of his life together, and could see where ambition turned to greed, and where that greed had transformed his life into something painful for himself and others. In his enlightening the Christmas classic comes to life with all the things that we hold near and dear to our hearts at Christmas time.